The Basin View Retirement Village Gardens were designed by Paul Van der Werf of Earthan Group. Australian Aquatic Biological is part of the Earthan Group and the gardens were constructed and installed by Robert McCormack of Australian Aquatic Biological and Paul Van der Werf, Earthan Group www.earthangroup.com.au in November-December 2011. Paul has taken the garden from the initial concept plan to the final finished garden. 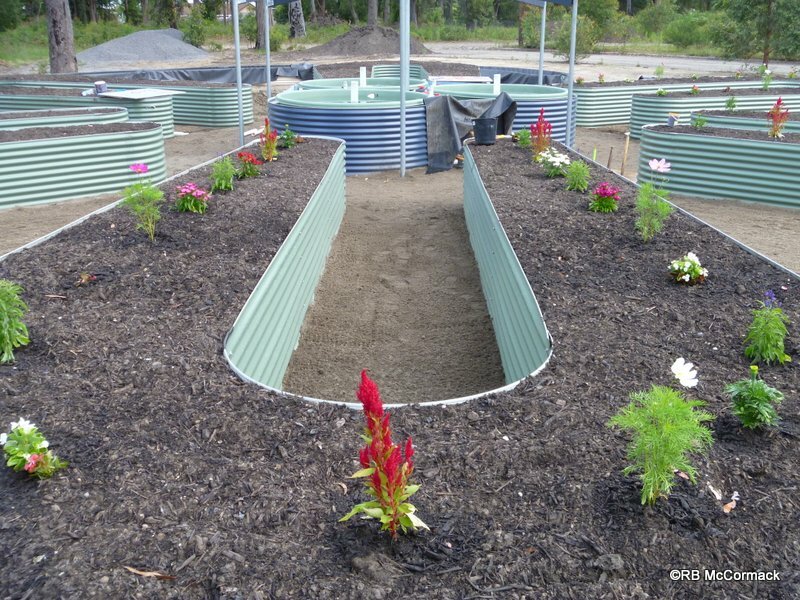 This is an integrated garden with central aquaculture tanks, earthen beds, deep water culture and hydro clay media beds. 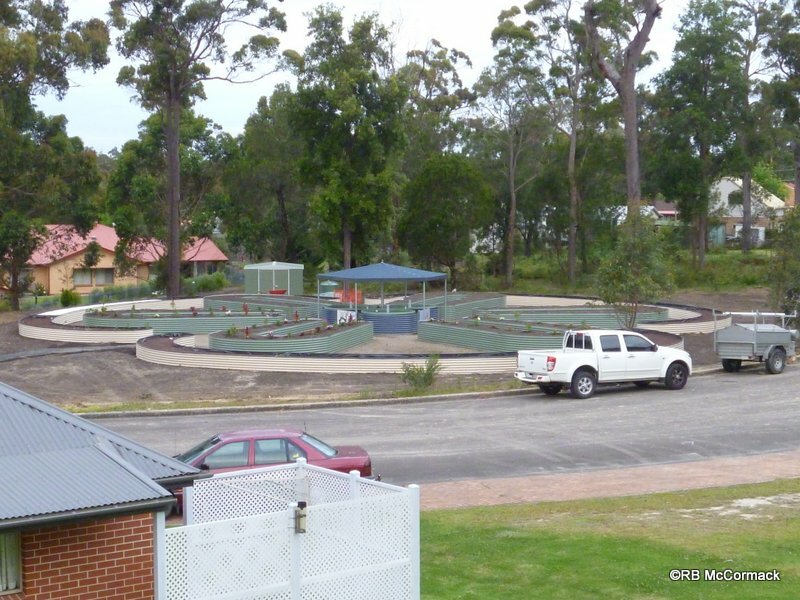 This is the largest integrated garden ever constructed in Australia. The central aquaculture section consists of 3 only 2000ltr aquaculture tanks with independent aeration and flow through water. 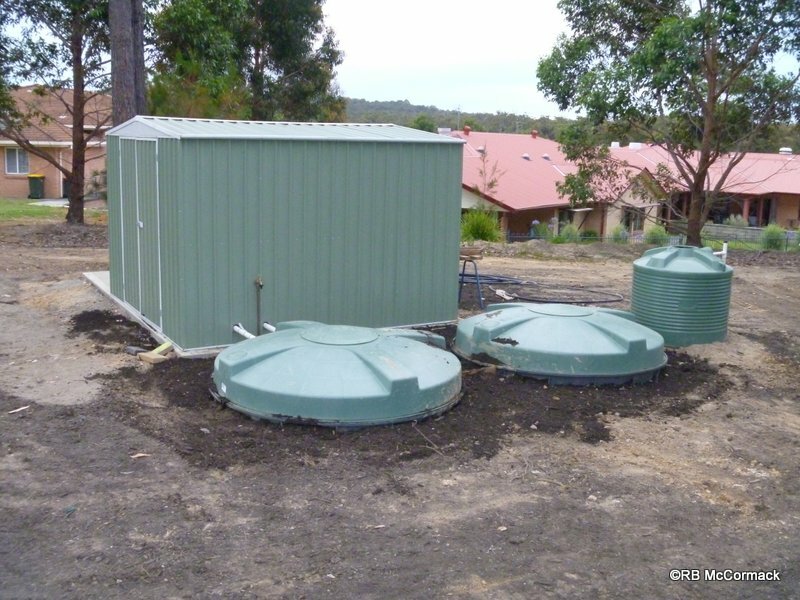 These three tanks are covered by a shade cloth gazebo to reduce the sunlight and the polymaster aquaculture tanks are encased in earth to offer insulation. 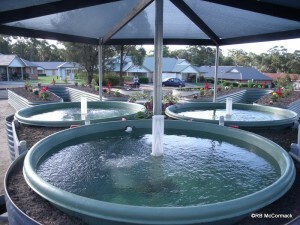 Each tank will be stocked with 100 silver perch (Bidyanus bidyanus). These tanks are the engine for the gardens. The only additive required being the fish food to feed the fish. Each aquaculture tank services one outer bed with water flowing from the aquaculture tanks directly to the outer beds. The outer beds are huge curved beds with a central deep water culture section and hydro expanded clay media beds at either end. 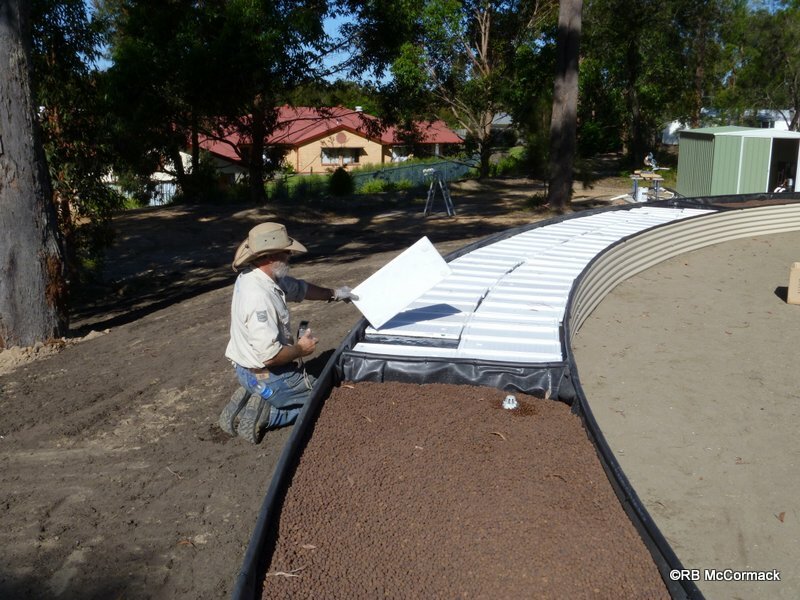 The outer beds are 30 metres long with a 10 m central water section and two 10 metre expanded clay beds at each end. Water enters the centre of this bed and then flows to either end. The centre section receives the water directly from the fish tanks and the water contains nutrients in the form of any fish wastes, ammonia and uneaten fish food which is discharged into this outer ring. This ring of water has a central aeration line of leaky pipe and has a substrate of cut up pieces of PVC in which a health population of yabbies (Cherax destructor) live. The yabbies thrive on the uneaten fish food and any fish wastes, cleaning up any leftovers. Floating on top of the water in this tank are floating rafts. These are just foam broccoli box lids that float, covering the waters surface to reduce evaporation and provide shade and protections to the yabbies living underneath. 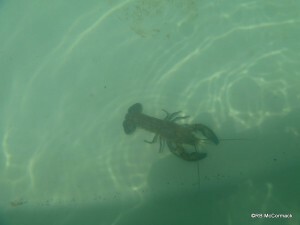 You cut a small hole in the lid, drop in a hydro basket and then drop in a lettuce or herb etc. to grow. 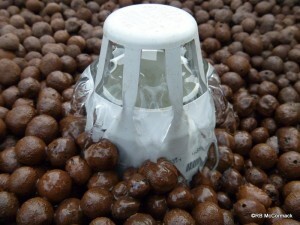 The lettuce for example will grow very quickly as the water is nutrient rich and highly aerated. Additionally, as the roots grow down towards the bottom of the tank the yabbies will eat the tips which will also help promote growth. Each of the three outer beds will produce 360 lettuces every 4-5 weeks and about 20kgs of yabbies/year. 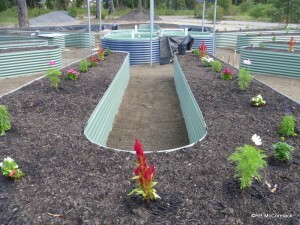 The water leaves the central aquaculture tanks by gravity and then flows under gravity through the garden beds. The deep water culture section is lower than the aquaculture tanks so water flows into them. Water enters the centre of the bed and then flows out each end into the clay media section that is at a lower height. Water then flows through the Nutrifield hydro clay media and drains out at the ends. 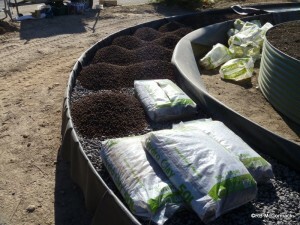 Nutrifield Hydro Clay is a natural growing medium that contains no harmful or undesirable substances. Hydro Clay is inert – meaning that it has a neutral pH, is resistant to chemicals and will not break down easily. 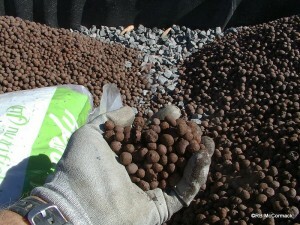 Pelletised clay that is fired in a rotary kiln at a very high temperature. During this process the organic compounds in the clay burn off, forcing the pellets to expand and become internally honeycomb like in structure; while the outside surface of each granule melts and is sintered. The final result is a ceramic like Nutrifield Hydro Clay pellet that is lightweight, porous and has a high crushing resistance. Hydro Clay helps to prevent oxygen starvation to the plants root system. When a plants root system is starved of oxygen the plants health suffers and growth rates decrease – this can be commonly attributed to over watering or an overly compacted growing medium. Due to the shape and structure of Nutrifield Hydro Clay, the oxygen starvation can be prevented by keeping thousands of pathways open for the exchange of gases and drainage of water. 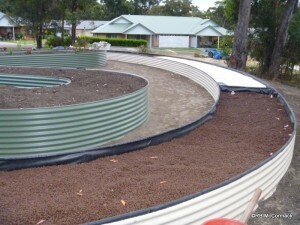 The outer beds are initially filled to a depth of 300mm with a 20-40mm diameter drainage gravel through which the water flows. On top of this is the hydro clay in which you plant your plants. The expanded clay is very gentle on the hands so you just scoop a bit out of the way, drop in your seeding then move some clay balls back around your plant. You never have to water your plants as water hydrates back up the clay media and as the plants grow their roots move down into the drainage gravel which gives them stability and has aerated water flowing through it. From each end of the outer beds water flows out to a horseshoe bed. 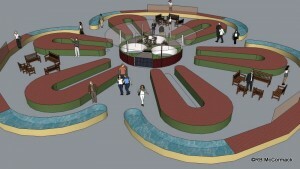 Each horseshoe contains 15tonne of media. Gravel on the bottom and soil on the top. Water continuously flows through the gravel so as your plants grow in the soil their roots travel down into the gravel with the flowing oxygenated water and they thrive. That’s the advantage of this type garden, its incredibily water efficient and you don’t need to spend time watering your plants. Water enters each horseshoe bed in the centre and continuously flows to the ends where it flow out and to the sump. The garden has two sumps to hold water. They are buried in the ground for temperature stability and astetics. Next to the sumps is a small garden shed to house seeds and garden equipment and it also holds the system equipment. We have a water pump and an aerator that runs 24 hours a day. 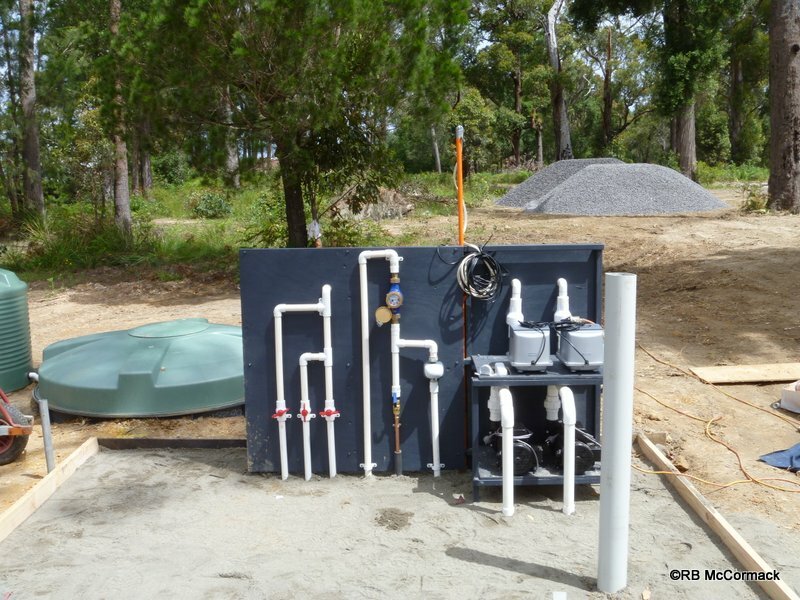 The water pump continuously pumps water from the sump to the aquaculture tanks and then gravity brings it back via the beds to the sump. The shed also holds an aerator that continuously supplies air to each sump, the aquaculture tanks and the deep water culture (yabby) beds. The sumps stores water with bio media added to help the biological processes. 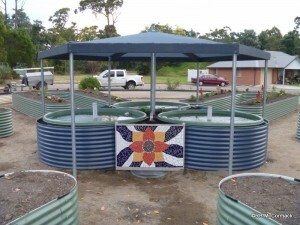 All the tanks and beds are designed for water catchment so when it rains they catch and retain water. In total the system retains 50,000 litre of water and can go 3 months without rain before a top up from mains water maybe required. The whole garden is automated and designed to be problem free. There is a pack up water pumps and aerator online that will automatically switch on if the main pump fails for any reason. If additional water is ever required it will automatically top up from mains. All that’s required is to feed the fish (top up the auto feeder), plant your seedlings and water them for the first few days then harvest your crop. It’s was a fantastic project covering around 900m2. Despite the wet weather during construction I had a great time working with Paul and all the people at the Village were extremely helpful and encouraging so a great work environment. A special thanks to Denise Leroy, the General Manager of the Village and her husband Lex, and to volunteers Leonie and Danny Fleming without all their help and support Paul and I would not have made it home for Xmas. Glad to hear that you in the market for expanded clay,This is Shijiazhuang Ningshu Trading Co.,Ltd. We produce and offer Expanded Clay Aggregate with good quality. Widely used in Roof gardens,Hydroculture cause it’s chemical neutral and ensure air penetration to plant roots. at the same time,fungal spores,bacteria and insect pests are avoided. Usually Packing is 50L plastic woven bags,or can be packed as your request. If any required, please feel free to contact us.